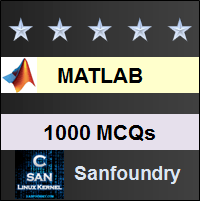 This set of MATLAB Multiple Choice Questions & Answers (MCQs) focuses on “Modeling – 1”. 1. What has been modelled in the following Simulink screenshot? Explanation: Since the step function is given as an input to the system whose transfer function is s, the above screenshot shows the modelling of a system whose impulse response is a step function while the input is also a step function. The graph suggests that step time is 0. 2. The system, that has been modelled in the following Simulink screenshot has ___ initial conditions. Explanation: We note that the ramp function does not start from 0 at t=0. This implies that it has some initial conditions. 3. Digital systems ______ in Simulink. Explanation: Logic systems and bitwise operator section under Simulink provides the user with a multitude of operators for digital system. MATLAB also has HDL doe verifier. Explanation: The logical operations present are AND, NOT, OR, NAND, NOR, XOR and XNOR. Hence, the correct option is 7. Explanation: By clicking the head of the arrow, we can drag it and change it’s direction. Also we change the alignment of the body by keeping the cursor pressed on the arrow body, while moving that part of the body. It does show on the screen, i.e. it’s head and it’s tail. 6. The output at scope 1 is? Explanation: The derivative of the step function is 0. This is because the step function has a constant amplitude. 7. What have we modelled here? Explanation: The output of the derivative block will be 0. Hence this system shows a model of the event described in capacitor which is blocking DC. Note that to model option inductor which is blocking AC, we need an integrator which takes a high frequency sinusoid. 8. What can be the possible limitation of this block? Explanation: The system having more zeros than poles is extremely unstable and not realizable. Hence, this is the only possible limitation of the given block. Explanation: In the window, which contains the graph obtained from the scope block- there is the option of Configuration Properties in the View option. We can modify the limits of both axis from that segment. The layout and style options don’t contain the axes. 10. For this block, the early voltage is always infinite. Explanation: The Early voltage can be specified amongst the parameters of the NPN B.J.T. It can also be put to Infinite for the sake of calculations- though it never happens in reality.